Long Legal Battle Over Marshfield Beach Access Ends With Win for Town. Northern Construction Co. begins seawall cap and stairs repairs. Marshfield Coastal Advisory Committee Meeting, 6 PM @ Fieldston Seawall. Green Harbor Beach Water Test FAILS Public Safety Test! Marshfield Special Town Meeting Voted YES for Article 14! 9 am - 4 pm, Furnance Brook Middle School. The selection committee recommended five of the nine applicants for appointment. Marshfield Capital Budget Committee recommends $5 million for seawalls and riprap. Marshfield town officials are urging residents to come out and vote at the Special Town Meeting on April 22 to support several articles that will help the effort to shore up the seawalls. Info about federal assistance due to the snowstorm Feb. 8-9, 2013. Marshfield DPW Director Calls Beach Destruction "Devastating"
All of Marshfield’s seawalls withstood the blizzard with no breaches. DCR plans for Nantasket beach erosion: phase one, reduce direct wave action on the seawall by putting a revetment in front of it. The second phase would be to bring in sand to rebuild the beach. 7:15 PM at Marshfield Town Hall, Selectman’s Hearing Room. To completely replace a 1,100-foot stretch of sea wall in the Fieldston Beach neighborhood, strengthen the revetment in front of Hewitt’s Point and design a project to replace sea wall extending into Ocean Bluff. Department of public works superintendent Tom Reynolds attended meetings where residents voiced concerns about the town’s 2.4 miles of seawall. On Dec. 3 he presented a proposal to the board of selectmen to begin to address the issues. According to a 2009 statewide study of all public infrastructure along 1,730 miles of the Massachusetts coastline, almost 80 percent of coastal structures have outlived their 50-year lifespan. Furthermore, this infrastructure has gone unrepaired — 85 percent of public infrastructure had no major repairs from 1958 to 2009. Rexhame Beach, Marshfield, MA – Sat or Sun – ON CALL. Rexhame, Fieldston, Brant Rock and Green Harbor are tested once a week, every Tuesday, by The Massachusetts Dept of Public Health (MDEP) for Enterococci - intestinal bacteria found in humans and animals. High levels of enterococci indicate the waters may also contain other disease-causing microbes that are present in sewage. Samples taken on Tues require 24 hours incubation. If test results exceed 104 colonies; the beach is posted "CLOSED" to Swimming on Wednesday. Town officials need to remember for whom they work and show a little more respect to those citizens interested in helping solve the problem, not only for their sake, but for that of the entire community. Citizens concerned about future coastal protection will gather Wednesday night, Aug. 15, at Marshfield Town Hall in meeting room 3 at 7:30 p.m. to take further steps in the formation of a citizen’s coastal coalition representing the interests and voices of inhabitants of Marshfield. Seawalls and their maintenance dominated the conversation as residents brought concerns and specific issues to the board of selectmans attention. The stairs to Sunrise Beach concern neighbors due to the rusted sharp railing and rocks piled at the foot of the stairs making access to sand and sea treacherous. FIELDSTON AND BRANT ROCK SECTIONS, MARSHFIELD (10th CD) - A Section 103 feasibility study is authorized to investigate storm tidal flooding issues in the Fieldston and Brant Rock sections of Marshfield, Mass. The entire study effort which may lead to project design and implementation authorization will take about 18 months to complete. 7:00 PM @ St. Ann’s by the Sea Parish Hall, 591 Ocean Street, Ocean Bluff. Neighborhood Meeting – Open forum for public comments/questions. Residents gathered recently to discuss concerns about hazardous access to the beach. After 14 years, the private vs. public ownership debate has no trial date. Boulders at the 3rd Road entrance to Sunrise Beach in Marshfield make walking onto the beach dangerous. Beach posted as unsafe for swimming due to high levels of Enterococci. Coastal study working group discussion. Construction crews work on a length of sea wall along Bay Avenue in the Green Harbor section of Marshfield. 9:00 am - 4:00 pm. Pick up and drop off bags at Furnace Brook Middle School, rear parking lot. The state of the South Shore’s coastline is both a personal and a professional issue. He happens to live in Marshfields Green Harbor and also is a marine field technician at the Woods Hole Group, an environmental consulting firm in Falmouth that helps private homeowners and municipalities fight the effects of erosion. Open Meeting Law complaint filed over BOS handling of the Marshfield Seawall Committee. Marshfield Seawall Committee members beat Selectmen to the punch and dismantled the group by resigning this week. On Wednesday night, all five members of the Marshfield Seawall Committee resigned from their post and formed a citizen action group that will represent residents of the community. Please read the Marshfield Seawall Committee's official statement on disbanding. Coastal issues and preventative measures for community safety have been a growing focus of joint meetings among South Shore towns. Instrumental in securing emergency funds for seawall repair on two occasions, Murray said he was pleased to see the progress that had been achieved in the susceptible areas of the coastline. A $30,000 grant from GOMC was supplemented by over $15,400 of in-kind services from the three Town Planners and a Regional Planner from Metropolitan Area Planning Council (MAPC). Paul Halkiotis, Marshfield's town planner served as the project manager. The report contains a compilation of existing studies, an explanation of sea level rise trends and projections, inventories of coastal structures such as seawalls and jetties, strategies to avoid or mitigate flooding impacts and funding options for coastal infrastructure to minimize flooding impacts. Monday 7 PM @ Marshfield High School Gym. Beach Village inhabitants are urged to attend "Special" Town Meeting and support the amendment of Article 6 ! The last day to register to vote for Marshfield Special Town Meeting is now April 15. All seasonal inhabitants must complete their registration forms by Friday, April 15th 4:30 pm. Work on this project is proposed to be concentrated in research and presentations to the communities related to adaptation planning and financing coastal infrastructure maintenance. The MAPC funding would allow the towns to take action on protecting infrastructure ahead of time rather than reacting to a crisis down the road. Keep Marshfield Clean - Rid Litter Day. Pick up and drop off bags at Furnace Brook Middle School parking lot 9AM to 4PM Sat & Sun. Lawmakers Turn Eye to state’s Battered Sea Walls. Lawmakers deeply concerned over Massachusetts’ aging sea walls will meet tomorrow to discuss how to fund repairs needed to adequately armor residents against the ocean’s fury. Marshfield Seawall Committee has a NEW web site with betterment facts, voter registration information and meeting updates. Wednesday 7:30 PM @ Town Hall hearing room 2. This meetings primary objective will be to discuss final betterment numbers (property imposed a betterment tax) and a revision of the informational packet. Meeting to discuss the seawall betterments and vote on Special Town Meeting articles. Beach Village inhabitants are urged to attend this open forum to discuss the seawall articles that will be presented at Special Town Meeting. Wednesday @ 7:15 PM at Seth Ventress Hall, 76 South River Street. BPW meeting at which the Town Meeting articles regarding betterments and seawall issues are scheduled to be presented to the public. The Board of Public Works urges Beach Village residents to attend this meeting as the BPW will be requesting funds for seawall reconstruction and they need our support. DUXBURY - Town Manager Richard MacDonald recommended against charging a betterment fee for sea wall repairs. • Meeting Agenda Minutes: this committee will be an advisory board consisting of 7 members. • Meeting Agenda Minutes: Robert Shaughnessy, BPW board, admitted that Town Hall had NO interest in the 2007 Seawall Committee and that citizens appointed to the "dismantled" committee were never allowed to convene. Board Discussion: Marshfield Seawall Committee. Monday 7 PM @ Marshfield High School. Inhabitants of Marshfield Beach Villages are urged to attend and Vote YES on Article 1 and 8. • Town of Marshfield Special Town Meeting Results. Fieldston Beach - construction crews worked throughout Thursday shoring up another section of seawall that is in danger of collapsing. Wednesday night, 160 feet of seawall -north of the May breach- started tilting towards the sea. Contractors propped up the wall with boulders, in hopes that it will survive winter storms untill funds can be approved for reconstruction. • Beach cleanups scheduled throughout the months of September and October. Saturday @ 9 AM - Help keep Green Harbor Beach clean, healthy and beautiful. Town Planner Paul Halkiotis says town, region must confront impacts of climate change. Halkiotis told selectmen that Marshfield should form a shoreline advisory committee -separate from the seawall committee- to find ways to adapt to climate change. Marshfield might be hard-pressed, he says, if another sea wall fails. "The homes along our shoreline and the families that live in them are a huge part of the identity of our community. Our beach front neighborhoods are a key part of our community character. The value of the infrastructure along our coast is worth millions of dollars. These things are all at risk. For these reasons we must address these issues proactively" Halkiotis said. Selectmen Chair Patricia Reilly says Marshfield has under-funded the town's sea wall maintenance program. "The town has to be pro-active. We can't afford to be reactive, which is how we handled the sea wall," she said. Selectmen will call for a joint meeting with the Department of Public Works, Conservation Commission, the Planning Board and the public to consider the town's response to climate change. That meeting will take place after the fall town meeting, most likely at the Furnace Brook Middle School. Saturday 11:00 AM - 2:00 PM at Rexhame Beach parking lot. ALL Marshfield Beaches are CLOSED till further notice. Due to dangerous surf and rip currents, NO people should be on the beach, seawall or jetties. Every Tuesday during the Summer: Green Harbor, Brant Rock, Ocean Bluff, Fieldston and Rexhame beach waters were tested for Enterococci bacterial contamination. HOW ARE MASSACHUSETTS BEACH WATERS TESTED? * DCR beaches are tested once a DAY and fly Red/Blue warning flags to swimmers. * 5 of Marshfield's 11 beaches are tested once a WEEK and fly NO warning flags. June - August: 75 salt water beaches on the South Shore were tested once a week by The Massachusetts Dept of Public Health (MDEP) for Enterococci - intestinal bacteria found in humans and animals. High levels of enterococci indicate the waters may also contain other disease-causing microbes that are present in sewage. Samples taken on Tues require 24 hours incubation. If test results exceed 104 colonies on Wed, the beach is posted Closed To Swimming. • Bacteria counts increase at Marshfield beaches © GateHouse News Service. Monday night Marshfield Special Town Meeting overwhelmingly approved funding to rebuild the Fieldston seawall. The public seawall was the only item on the agenda and was approved in record setting time: less than 1 hour. Reconstruction is expected to start in October and be finished by December. • Special Town Meeting approves seawall project © GateHouse News Service. 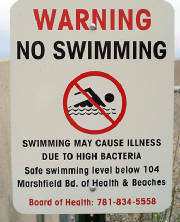 WARNING: Marshfield Beaches Post High Bacterial Counts! Sunrise Beach is posted as unsafe for swimming again! 9th Road was tested July 27 and posted CLOSED on Wed July 28 due to high Enterococci bacterial count. Water will be retested Thursday morning. Lab results will be available Friday afternoon. The Marshfield Board of Health strongly urges the public to avoid contact with the water, since it may cause illness. The 2nd Annual Bob Pollard Noseriding Memorial will take place at Rexhame Beach in Marshfield at noon. Register that day at the beach or pre-register at Luminate Surf and Skate. Free surfboard and wetsuit rentals are available for contestants. The entry fee is $25 and includes a T-shirt and a barbecue lunch. All proceeds go to the Bob Pollard Trust. Bring your own perchlorate free fireworks to Marshfields public shoreline and beaches. This year there will be plenty of room for everyone: High Tide: 5:01 / Low Tide: 11:09 PM. Sunset 8:22! Paddle out, catch a wave, spread ocean awareness. Surfers from around the world will unite in celebration of the annual holiday. As is tradition, surfers will do their part to give back to our oceans, waves and beaches through various organized events such as clean-ups and restoration projects courtesy of the Surfrider Foundation. SB/OB Email ALERT! - Spammers hijacked our email address. If you received sunrise beach emails this week, Sorry For The Spammy Inconvenience! Delete the email from your address book & place them in your Junk folder. • New SB/OB Email is on the Links page. This weekend marks the official kickoff to Marshfields Beach Season - which doubles the towns traffic and population. Keep in mind "The litter you dump on the beach today, You’ll be swimming in tomorrow". Kindly dispose of human and pet litter properly: Trash and Recycling barrels are conveniently located at public beach access points. Enjoy and respect Marshfield's seashore. 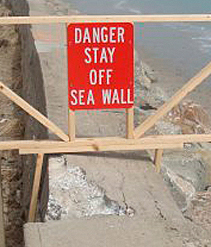 • Seawall Construction Project - Marshfield Emergency Management Agency. KEEP REXHAME BEACH PUBLIC! 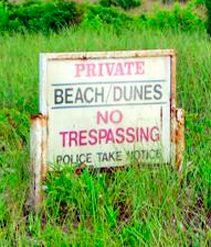 Members of the Rexhame Terrace Land Trust continue to seek private streets, dunes and beach rights. Don't let RTT deny public strolls from Brant Rock, Ocean Bluff Beach, Sunrise Beach, Fieldston Beach, through Old Rexhame Beach and the seashore beyond. • Town of Marshfield votes YES on Article 16 to continue with the Rexhame Beach litigation. • MARSHFIELD TOWN MEETING HIGHLIGHTS - Night one © GateHouse News Service. This weekends Noreaster broke the seawall gate at Brook Street beach access ramp. First wave bent the wooden gate. Next wave -with a loud BOOM- popped it out of the seawall. BEWARE of DAILY FLOODS - each and every high tide, waves overtop the cement jersey barriers flooding Brook Street, Foster Ave, Ocean Street, Rt 139, and down to Plymouth Ave.
COASTSWEEP will kickoff its 22nd year on September 19, 2009. The coastal cleanup effort in Massachusetts is part of an annual international campaign to encourage citizens to volunteer to remove debris from their local coastline and nearshore marine areas. Funded by the Massachusetts Office of Coastal Zone Management (MCZM). Organized by the Center of Marine Conservation in Washington D.C. Sponsored by Ocean Conservancy and many others. • Marshfield Beach Water Testing Results - MDEP. • MA Bathing Beaches - EOHHS. • High bacteria counts at beaches © Marshfield Mariner. Need a legitimate excuse to go surfing? "You finally have it! ISD, this unofficial, official surfers’ holiday gives us a chance to promote and celebrate the sport while bringing awareness to the state of our oceans and beaches. Take the day, or part of the day, to catch a wave or three and-- while you’re at it -- help clean up your favorite beach, in conjunction with Surfrider Foundation, we’ll be organizing official beach cleanups, but that doesn’t stop you from beautifying your own stretch of sand." BOS/Board/Committee Liaisons – "Michael Maresco read through the list of committees and asked each Board member which committee they would prefer to be the liaison to. The Board decided on the following: Seawall Committee – John Hall." MARSHFIELD RID LITTER EVENT -Help Keep Marshfield Beautiful! This year supplies are available at Town Hall, Marshfield High School Gym, and select stores. Join the Marshfield Chamber of Commerce, Marshfield DPW and Beach Commission. "We supply the trash bags and gloves! You supply the time & energy!" Many THANKS to all involved, another successful clean-up day! "PRIVATE BEACH PROPERTY. No Trespassing!" Ocean Conservancy was one of three non-profits taking part in Stonyfield Farm’s "Bid With Your Lid” campaign. "Bid With Your Lid” is an annual consumer promotion sponsored by Stonyfield Farm to build awareness of and interest in various environmental and socially responsibility issues. Congratulations Ocean Conservancy! • "Bid With Your Lid" - RESULTS POSTED HERE! Ocean Conservancy's International Coastal Cleanup is the world's largest volunteer event of its kind. Each year, thousands of volunteers from around the globe participate, clearing tons of trash from coastlines, rivers and lakes and recording every piece of trash collected. Join this year's cleanup on Sept. 20, 2008. Coastsweep 2008 - "Promoting MA Clean Beaches Since 1987"
Coastsweep is the annual state-wide coastal cleanup sponsored by the Massachusetts Office of Coastal Zone Management (CZM), and coordinated by the Urban Harbors Institute (UHI) of the University of Massachusetts Boston. Each year, thousands of volunteers take to the beaches and seafloor to help remove debris that would otherwise pollute our oceans. With more than 1,500 miles of MA shoreline to clean, we need your help! Walk, Swim, Paddle a kayak, or Dare to Sit on Old Rexhame Beach and demand your public beach rights. Join our beach neighbors & Protest on Saturday! WHERE ? From SB/OB head North, just beyond the end of the seawall, our neighbors will be gathering on Rexhame Beach (between Kent and Waterman Avenues). • Residents protest for public beach rights © The Boston Globe. • Residents protest Rexhame Beach settlement © Marshfield Mariner. Enjoy the Beach, Respect the Beach... Clean-up after Yourself! • Don't litter! Trash barrels are conveniently located at all the SB/OB public beach entrances. Public recycling "not yet available" again at SB/OB. Maybe next year? • Keep covered! The Red Buggy issues unprecedented "open beverage" fines. Adults can stay cool & covered, purchase a "MarshVegas" or "Rebar Beach" coozie at OB, Rexhame, Brant Rock packies. • Don't dump! Keep the beach clean, healthy, and safe for our kids to play in. Obey the Towns Leash Law and scoop up dog deposits. Happy 3rd of July MarshVegas! Join Our Celebration! Again, No Public Marshfield Fireworks. 6:01 PM low tide guarantees packed Marshfield public beaches waiting for 3rd of July private display of independence. Bring your own perchlorate free fireworks and Enjoy a Happy 3rd... and 4th too! ** Sad to find 4th and 5th of July beaches LITTERED with fireworks debris and litter. Maybe 2009 will find more citizens in the Marshfield Clean Beach Initiative? Marshfield Gets New Buggy to Patrol Beaches. "Police and the harbormaster staff will zip around the town’s beaches, woodlands and harbor this summer in a new red buggy. The 4X4 vehicle, called a “mule,” came free to the town via a public safety program of the Kowalski company, sponsored locally by Pilgrim Power Sports in Plymouth." • © The Patriot Ledger. "Community minded citizens, neighbors and friends" are encouraged to participate in this year's annual cleanup of Marshfield neighborhoods, parks, and beaches. • Saturday May 3, pick up supplies, bags and gloves at the Furnace Brook Middle School. • Sunday May 4, drop off collected litter at the school. Sponsored by • Marshfield MA Chamber of Commerce. Many THANKS to the Marshfield MA Chamber of Commerce and to Everyone who participated in this years clean-up of SB/OB Beaches. Hope you will join us again next year! State representative, Frank Hynes announced last week that he would not be running for re-election. His dedicated service and concern for protecting Marshfields public shoreline and infrastructure will be greatly missed. Hopefully the next State Rep will follow in his footsteps! • Member of the MA Coastal Hazards Commission. • Infrastructure Plan Working Group (Chair). January 2008 - Help Us To Protect and Restore Marshfield's Seaside History. Don't litter, Don't dump, Don't destroy dunes! Beach grass is a fragile plant that holds the dunes together. By simply breaking one blade of beach grass the plant can die immediately. People and pets walking on beach grass contributes to the destruction of the dunes and beaches. Help from the public is essential: Do Not Wander Off Dune Paths! If we act now, we can preserve the dunes and enjoy our public beaches for many years to come. The battle to enforce public seawall contracts and rid the beaches of construction debris.